Adam Lambert Goes Country and Kills It! You are here: Home / Adam in the Media / Adam Lambert Goes Country and Kills It! Thank you to whoever was the brilliance behind choosing Adam Lambert to sing Girl Crush with Leona Lewis at the CMT Artists of the Year 2015. When I heard that Adam was performing on this show, I was dumbfounded. Adam singing on a country awards show? Who can forget the day on American Idol Season 8 when after singing Ring of Fire, Adam told Simon Cowell he probably wouldn’t be going to Nashville? Of course he performed there for his Glamnation Tour in 2010 and was a huge hit. But still the same, Adam singing on a country awards show? I can only hope Randy Travis was in the audience! I’d like to hear from Simon on what he thought after seeing Adam give one of my already all-time favorite performances. Just his appearance alone was amazing! This was the most conservative I’ve ever seen him dress. Just like on Idol – he knows who his audience is. Of course Leona Lewis was fantastic too! Her voice was a terrific pairing with Adam’s. I’d love to hear more collaborations from them in the future. Ironically, both Adam and Leona got their start on shows from Simon Cowell, with Leona coming from U.K.’s X Factor. But after watching Adam sing this, his appearance made total sense. He got it, the band got it, the audience got it. And secretly, who hasn’t imagined Adam having a Girl Crush on them? Not to mention how infectious this song is. I can’t get it out of my head! Watch this performance courtesy of cmt.com, and join me in appreciating the genius behind choosing Adam to sing this song. Did you catch the reactions of approval from the members of the band? 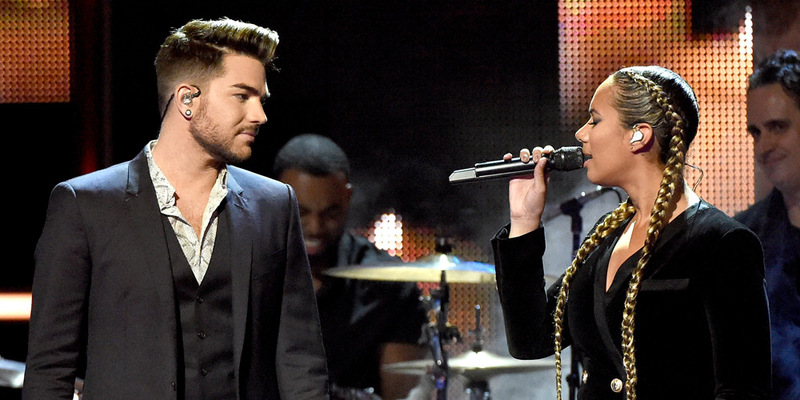 Outstanding Adam and great with Leona Lewis – WOW. I have been watching the video nonstop for the past two days. It is so awesome to see him on a show in the states. Maybe this will open up some eyes to people here and realize that Adam deserves to be on other music award shows and should be winning awards for his talent. There is no one out there with a voice so pure and wonderful as his. I can’t put it in to words on how wonderful it is to hear him sing. I loved seeing Adam the other night on tv! I hope we will see much more of him in the future. ADAM IS PERFECTION…wish I could get into the brains of the”powers that be” so they would admit what we all know…Adam is the best, the greatest talent today…really simply. WHY IS HE NOT ON EVERY AWARD SHOW IN THE U.S. Not only will he add TRUE TALENT, but he’ll bring some needed CLASS to every stage. Adam looks so handsome and comfortable during this song. I, too, can not get this song out of my mind and have watched this video many times over the past few days. I have loved Adam-( voice, charisma, personality and look) since he first auditioned on American Idol. He has never once disappointed me in any way. To think that this beautiful soul could have had a crush on me-( in my youth)-what an interesting thought! Was excited to see and hear Adam again. That man can sing anything and pull you in. Now country musicians can see and hear why we love him. Heart of gold. Now there is all of us ladies wonderful Adam Lambert. He is just such a fox. And how could we not love him? I love you Adam. And Honey as Simon said “You can sing the phone book”. Lovely Leona too. Thank-You for this video Carol. I could watch it 50 times with out stopping! I taped it and I have been watching it over and over again. His voice is a beautiful as he is. I also thought of Randy Travis when he said “I just don’t what to think of this boy. I never saw a man with nail polish on before.” And after ADAM sang his version of Ring of Fire when Simon Cowel said What the hell was that?” Now what do you think Randy and Simon? ADAM DID COUNTRY AND THEY LOVED IT!!!!!!! I have only one criticism, I wish I had know about this performance before the show , I would of watched it ! Adam can sing anything. I never heard of Girl Crush before, I try not to listen to country. So much of it sounds the same. Adam has the voice that opens ears. Whoever had the idea to put these two amazing performers together for this song, should me awarded. Such a smart decision. Hopefully more people will be introduced to Adams talent ! Does anyone know “why” Queen with Adam Lambert isn’t doing the Superbowl ? Coldplay, rely ? I was able to tape the show after-the-fact. It is on the CMT Channel (which I’ve never watched) and it was replayed a few times. Check your Guide for more showings. I think it is still playing. How about On Demand? I have watched it now several times. I was so excited to hear that this country awards show wanted Adam to sing on it. I am thrilled. I love the song, and I think the original singers are actually very good. But Adam is the best singer alive as we all know. He looked and sounded great with Leona. I’m not a country fan, but he can sing just about anything and it would be interesting to me. I’m also glad he was introduced to a larger audience! Oh, my God! Is it possible to download this onto my ipod nano? This is incredible!!!! Try a download & converter program like Real Player. I was floored when I saw this, and I thought the same thing……I hope Randy Travis saw this and I’m sure he would be speechless because of how good Adam is. Well, good doesn’t say enough, I’ll just say I’ve been to see many different bands and singers including David Bowie and Adam sings better in person than David. It was cute though in the song….Adam got a little twang in there!! !